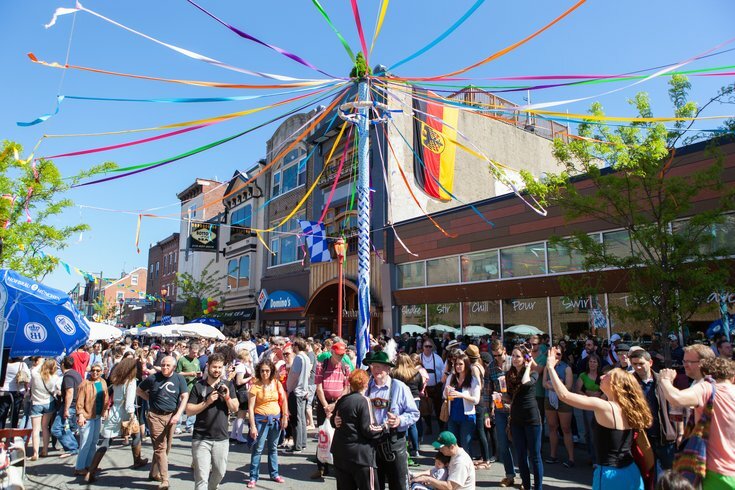 The annual Maifest has become part of South Street's spring festivities. South Street's annual Spring Festival floods the Headhouse District Saturday, May 2. From 11 a.m. to 8 p.m., the eight blocks of South Street between Front and 8th streets will be filled with an outdoor party of food, drink, shopping and live music. Restaurants along South Street will open with al fresco dining options and trucks, and mobile vendors will be on the streets, too. Some will have free samples while others will be pay-as-you-go with full menus. Interspersed with all the food, local boutiques and businesses will sell their wares -- as will 27 artists and crafters. Philadelphia Magic Gardens' ART/GAGE initiative will be showing in full force, with interactive art-based experiences sprinkled throughout the festival. Make-and-takes include the return of last year's popular DIY flower crowns. In addition to the family friendly and kid-oriented activities throughout the festival, a special Kids Zone will pack the 200 block. Activities will include live music and entertainment, arts-and-crafts projects and youth-focused vendors for shopping. Live music will be found throughout the eight blocks, with over 40 local acts performing across three main stages and seven performance areas. If indoor activities are more your speed, select restaurants and bars will host live music inside, too. Along the 700 block, Brauhaus Schmitz will host Maifest, its iteration of the German celebration of spring. Attendees will bear witness to the liter lift competition, where drinkers see how long they can hold a liter of beer in the air; it sounds boring but trust us, it's not. They'll also see the Maypole dance, called Maitanz, the chopping wood (Holzhacker) dance and the slapping feet (Schuhplattler) dance competitions as well as a ceremonial keg tapping. German food and drink will be available on a pay-as-you-go basis. Click here for the full festival schedule.